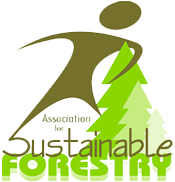 Welcome to the Association for Sustainable Forestry! The Association for Sustainable Forestry is a progressive organization which provides small private woodland owners with the financial means to implement forest improvement work on their properties. By taking a leading role in the principles and practices of Forest Stewardship, the Association works with silviculture contractors, woodland owner groups, and individuals to allocate and monitor the silviculture funds available through the provisions of the Nova Scotia Forests Act. Serving as a conduit between woodland owners and the forest industry, the Association is dedicated to ensuring the future health and enhancement of resources on privately owned woodlands.